We are delighted to announce that Vuda Marina has officially been gazetted as an Approved Boarding Station from the 3rd September 2013. Now arriving yachts can conveniently clear into Fiji waters using the Marinas floating dock where government officials will be waiting to greet the captain and crew and proceed with formalities. Captain and crew can then immediately start to enjoy their stay in Fiji by using the Marinas facilities, restaurant, café, bar, yacht chandlery, general store, ATM, laundry and fuel station. With easy access to Lautoka city, re-provisioning is simple and cost effective. Should work be needed on their vessel then access to a number of contractors is available and works can commence almost immediately through the use of the Marinas 63 Tonne Travel Hoist. Departing vessels can also do the same. This is a huge improvement in the arrival experience for those arriving in the Western side of Fiji whereby yachts had to previously clear at the industrial Lautoka Wharf, anchor in muddy waters, be boarded by government officials in a questionable dinghy, potentially be covered in cane fire residue, be surrounded by large, commercial container ships and generally start their stay in Fiji in less than ideal conditions. The master of the vessel must make written Pre-arrival Advance Notification using the C2-C form at least 48 hours prior to the Fiji Revenue and Customs Authority (FRCA). FRCA is the lead agency however sending the form to the following agencies will ensure an extra smooth arrival – Ministry of Health, Biosecurity Authority of Fiji, Department of Immigration and Vuda Marina via email or facsimile as per below listing. 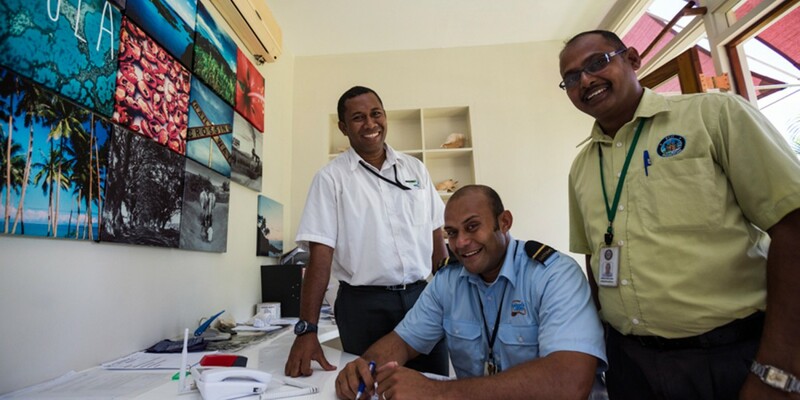 This has been a very successful collaboration between a private enterprise and numerous government agencies to simultaneously coordinate the necessary documentation and risk management in order to allow international yachts to enter into and depart Fiji through this progressive and innovative Marina. 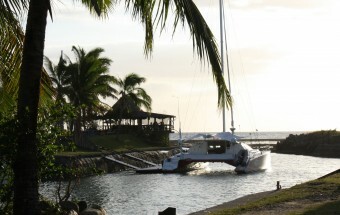 Ultimately making Fiji a more enjoyable experience for arriving and departing international yachts. The privately owned Vuda Marina Fiji has been in operation since 1996 and has inwater berthing for 78 vessels, hardstand working area for 30 vessels and 35 cyclone pits. Vuda Marina is a recognized cyclone and storm shelter located just south of Lautoka city at 17° 40’ 54” S and 177° 23’ 09” and is only 20 minutes from Nadi International Airport.